During a presentation to the International Association for Public Participation (IAP2) North American conference in Denver this past September, I had the pleasure of introducing participants to the polarization model, a strategic tool that helps my clients manage polarization, and the real or perceived hostility that often accompanies it, while being interviewed by journalists and during all forms of public consultation. Theoretically, every response to any issue can be mapped along a spectrum that goes from openly hostile on the left side to openly supportive on the right, with no opinion somewhere in the middle. Often, the person answering attempts to change the opinion of the person strongly expressing an opposing opinion. The goal is to bring that person, willingly or unwillingly, to the supportive side of the spectrum. This can lead to a tug-of-war. When that happens, nothing gets resolved. No opinions are changed. Whether opposed or supportive (and there are often many more opposed than supportive), everyone walks out of the meeting not having changed their opinion. Worse yet, they may move away from the logical toward the emotional end of the spectrum. However, research shows that the further you go from the middle to the outer edges on each side of the spectrum, the more you go from a logical to an emotional perspective. There are only three opinions about any issue. Positive, negative, and none. And there are only three things you can do with these opinions. You can reinforce a positive opinion. You can neutralize a negative opinion—not necessarily change it but neutralize it. Or you can form a latent or unformed position. When issues arise, there is little or no need to form opinions; the issue has taken care of that task because issues formulate opinions. To manage polarization effectively, therefore, two things need to happen. First, the organization’s perspective needs to be reasonable, rational, ethical and supportable. If it is, it’s defensible. Second, the organization can best defend its perspective by answering questions about it, not reacting to statements or sending even more information to the audience in the hope that somehow they’ll overcome their emotional anxiety and understand what is attempting to be done. If someone makes a statement that seems to drag the discussion to the left side of the spectrum, the receiver of that statement has two choices. He or she can politely ask the person to ask a question, or he or she can turn the statement into one or more questions, and ask and answer them succinctly. And when it comes to questions, the more the merrier. This means that the person answering questions should be clear and concise in doing so. Indeed, clear and concise answers to questions actually support the concept of transparency, which is important to any form of public consultation, essential to building trust, and increasingly critical in a wired world where everyone with a smartphone can feed into traditional and social media. By definition, consultation means listening, and I’ve long believed that the best way to demonstrate listening skills is to answer questions clearly and concisely. If done effectively, this approach can change opinions to the point that those who came in with an opposed but logical perspective may very well change their opinions, if for no other reason than they become disillusioned with those who are opposed and emotional. Finally, I provided insight into how IAP2 practitioners can guide their organization to answer questions effectively. I’ve long believed that the skill of answering questions is the least developed skill in human interpersonal communication. To improve that skill, three words are important: pause, answer, stop. When you are asked a question, pause and think. Not only is it polite, but it enables you to find the best answer for the question, which is almost always the shortest possible answer. Answer the question that was asked, and only the question that was asked. And, as soon as you’ve answered the question, stop talking and wait for more questions. 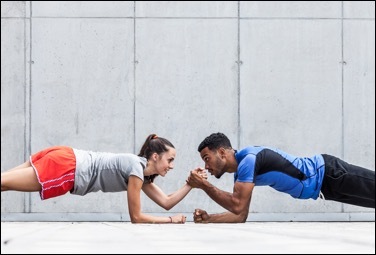 If the organization’s logic is reasonable, rational, sustainable and defensible, pause-answer-stop enables the audience to explore that logic and come to their own conclusion. As a general statement, I believe that media training should teach spokespeople to manage exchanges with journalists to win-win outcomes. We all know the organization wants to either protect itself or enhance its brand, or both. It should legitimately be attempting to use the exchange to influence specific audiences. Therefore, if a spokesperson wants to help the journalist's "win" (not to mention be polite and build a better relationships by communicating more effectively), answering questions clearly and concisely is the secret to success. Doing so enables the journalist to create a story that is relevant to the audience, interesting to read, watch or listen to, and factually correct. Yes, I have the answer; here it is. No, I don’t have the answer; I’ll get it for you (or find someone who can provide it). Yes, I do have the answer; I cannot discuss it. The case is currently before the courts. 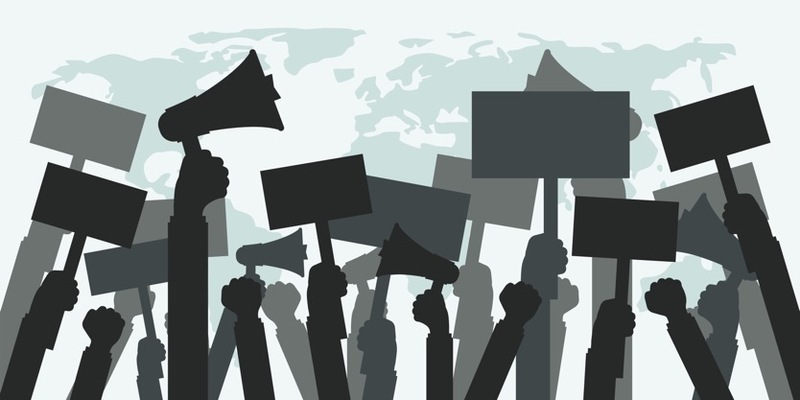 Union negotiations are under way, and a news blackout has been imposed. An emergency has occurred, and next-of-kin have not yet been notified. "I'm sorry. I cannot answer that question. Doing so would divulge sensitive competitive information." "I'm sorry, I cannot answer that question, because doing so would breach securities legislation." The situations above are legitimate reasons for not answering questions, but they are not barriers behind which an organization can hide. If your organization is tempted, it's important to discuss the fact that there are two courts in our social-media-driven land. In a court of law, the premise is that you're innocent until proven guilty. In the court of public opinion, the premise is reversed; silence can be (and often is) construed as guilt. Bottom line? Answer whenever you can. When you can't, don't. But say why. After more than 25 years of examining the concept and teaching it successfully, I am completely convinced that the most important thing we can teach presenters and spokespeople alike is to pause, answer the question, and stop talking. First of all, it offers protection during media interviews and hostile exchanges during all forms of presentations, when being quoted out of context or having words twisted is an issue. Does your legal counsel tell you to pause-answer-stop because he or she wants you to reduce or eliminate your credibility as a witness? No, the lawyer wants you to protect yourself and protect your credibility. Does the lawyer want you to pause-answer-stop so that you can put the case or organization at risk, which will then translate into increased billable hours? No. Although that's a bit tougher to answer (especially the part about more billable hours), the lawyer tells you to pause-answer-stop so you can protect the organization. If pause-answer-stop offers protection in a court of law, wouldn't it offer similar protection in a court of public opinion when someone is answering questions from a print journalist, or when a presenter is answering questions from a hostile community group, a semi-hostile management team, or a board of directors? It can. And it does. If you wish to reduce the risk of being quoted out of context by print journalists, the simplest solution is to reduce the context. Stop talking. 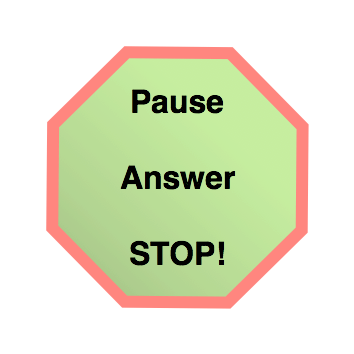 But beyond that, pause-answer-stop enables someone to communicate more effectively. By asking more questions, the person or people receiving the information can better educate themselves about the topic in question to create better understanding. Some years ago, we decided to put ceramic tile in our entranceway and kitchen. We were undecided about whether to do the job ourselves or to hire a contractor. One evening, I went to my local Home Depot to do some research. I had the good fortune of encountering a very confident young man who had obviously installed a lot of ceramic tile. How did I know he was confident? He did not feel compelled to talk endlessly whenever I asked him a question. In fact, he simply answered each question and stopped talking, waiting patiently for the next question. In the 15 or 20 minutes that we chatted, I easily asked more than 100 questions. My son was with me and, as we were walking out of the store he remarked: "Dad, that was amazing. I can't believe how much I learned. I know exactly how to install tiles and what needs to be done. You asked great questions." Actually, I didn't ask great questions. I was simply given the opportunity to ask a lot of questions -- which I would never have gotten if the person answering did not pause-answer-stop. We ended up hiring someone to install the tiles, so some could argue that he lost a sale and didn't achieve his organization's objectives. However, that's short-sighted. The reason? Based on that experience, this local Home Depot is my first stop whenever I'm even thinking about any kind of improvement to our home. I don't know who's coaching them, but I have been pleasantly surprised by the ability of a number of their staff to answer questions clearly, concisely and effectively. The same applies to other situations. Want a reporter to trust you? Want the management team or board of directors to trust that you'll deliver? Want to be more transparent? Teach yourself the same simple tactic. Pause. Answer the question asked and only the question asked. Stop talking. I have often said that the skill of answering questions is the least developed skill in human interpersonal communication. And it’s a skill I believe we could (and should) continually hone. As a general statement, we could all benefit by constantly working to improve how we answer the questions we’re asked. We all know that politicians are a category unto themselves when it comes to being terrible at answering questions. But Florida governor Rick Scott, the politician on Anderson Cooper’s RidicuList in this video clip, is in a league of his own. Yes, they do. But as Anderson Cooper aptly points out, ignoring questions “doesn’t really work. It just insults everyone’s intelligence.” And the insult can apply to everyone—a journalist in a scrum, an employee at a town hall, an upset or confused neighbour at a public meeting, or a sales prospect across the desk. Unlike virtually everyone else, politicians can get away with the non-transparent tactic of talking about “what’s really important” because they live in a gilded world built on the twin pillars of blind loyalty and least objectionable programming. It's time we realized that other industries do not have this luxury. In all democracies, there are people who are blindly loyal and have voted for one political party their entire lives. They will continue to vote for that party, regardless of whether a convicted felon or a narcissistic blowhard is leading it. For the vast majority of the rest of us, the choice is not for the most desirable candidate, but the least objectionable. The 2016 US presidential election was a perfect case in point. How many millions of people who are not blindly loyal to a political party actually voted for someone they wanted in the White House? But of all the elections in which I've personally voted since 1976, there have been only one or two candidates for whom I have been rooting. In virtually every other election, I find myself holding my nose and voting for the best of a bad lot. Politicians may be able to get away with not answering questions, but for the vast majority of the world, for which transparency is a growing issue, answering questions will continue to trump bridging to messages each and every time. Here we are, on the first official working day of the Trump presidency, and already time-tested traditions in media relations are being tested yet again. The president, whose focus on the size of anything and everything is unparalleled by any president I've personally witnessed (and I remember the day JFK was assassinated; I couldn't understand why The Friendly Giant was pre-empted), will quickly pick a fight with any media outlet that provides alternatives to his "facts." It began with the president proudly tweeting that the ratings for the inauguration reached 31 million. Some would think that's a fairly large audience. But the "alternative" fact is that more than 90 per cent of Americans didn't tune in. Two hundred eighty-seven million Americans didn't care, had better things to do, or were organizing protests to watch the inauguration. Then we get White House press secretary Sean Spicer ripping a strip off the media in his first full introduction to them. His behaviour was later defended by another member of the team, who said he was simply presenting alternative facts. As a communications professional, my heart goes out to Spicer. He has gotten his hands on one of the world's plums as press secretary, but it's both good news and bad. I hope he finds a balance that meets the needs of the administration but doesn't permanently damage his credibility with those on who he depends for a successful career in media relations. The good news is that he can always put that job on his resume. The bad news is that nobody may hire him in the future if he destroys relationships with journalists during his tenure at the White House. I don't know who coined the adage "I try to never pick a fight with someone who buys ink by the barrel and newsprint by the ton," but that adage is going to be tested unlike anything I've seen in my 35-year career. Ironically, the thin skin of the president and his White House may work to our advantage. If that group is so focused on fighting with journalists, maybe they won't have the time to pick fights with the likes of China, Pakistan, India or Russia—or anyone else in possession of bigger sticks than your average White House press corps. Time will tell. And we can only hope.